From Leavenworth we traveled to Lincoln Rock State Park in Washington, spent $4 and showered up, then spent the night outside the park near an old gas station. The park features camping, boating with launches, swimming, and boasts extensive playgrounds and ball fields for kids and adults like basketball, tennis, and volleyball. There are also cabins for rent. Then we drove to Chelan and spent the morning walking around downtown, eating breakfast and circumventing the marinas, and inlets surrounding Lake Chelan. Worth a stop and the surrounding drives both in and out of this area are beautiful, hilly and many times the waterfront areas are very pleasant temperature wise. 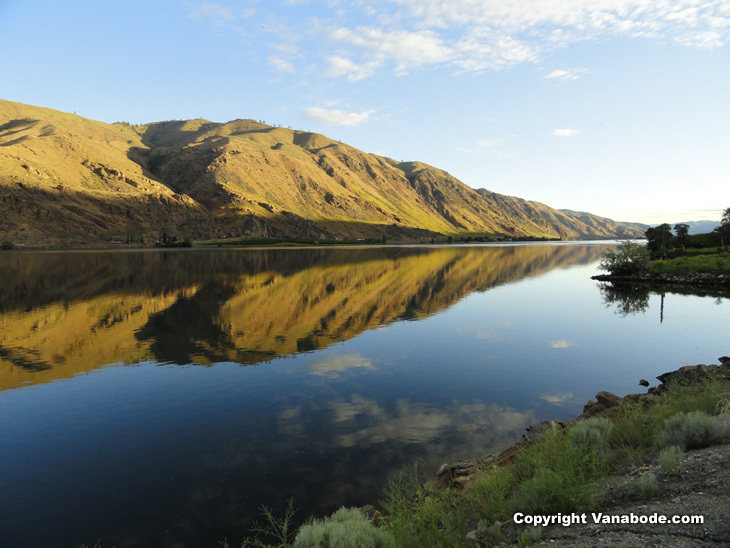 Above: Columbia River along highway 97 on the way to Chelan Washington. Above: Lake Chelan riverwalk pavilion part of the one mile waterfront walk. The small downtown shops and restaurants are within walking distance and you could easily hang out here all day relaxing in the grassy riverfront areas. Parking and bathroom use are free though there were no showers. 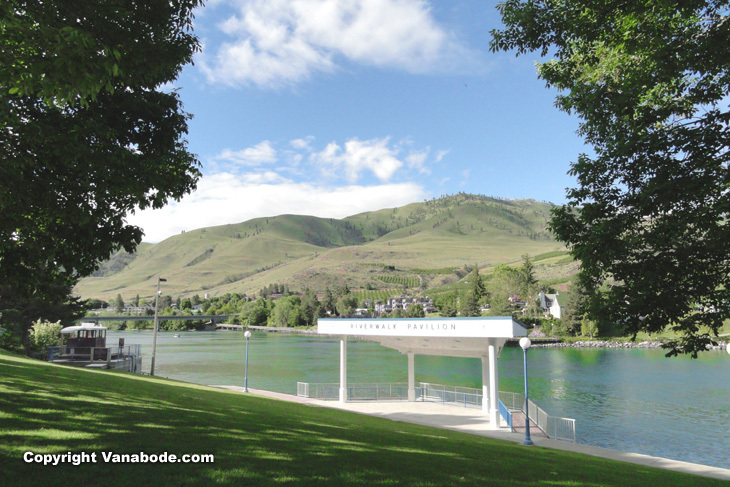 Lake Chelan has 14 boat in campgrounds that are operated on a first come first serve basis and most campgrounds have picnic tables, docks and vault toilets. Fishing is big here for stocked exotics like ocean trout and Chinook Salmon. The area has numerous lake side rv parks and other day use areas. The Mill Bay Casino is in nearby Manson just west of Chelan is a good place to Vanabode the night since they are open 24 hours a day. 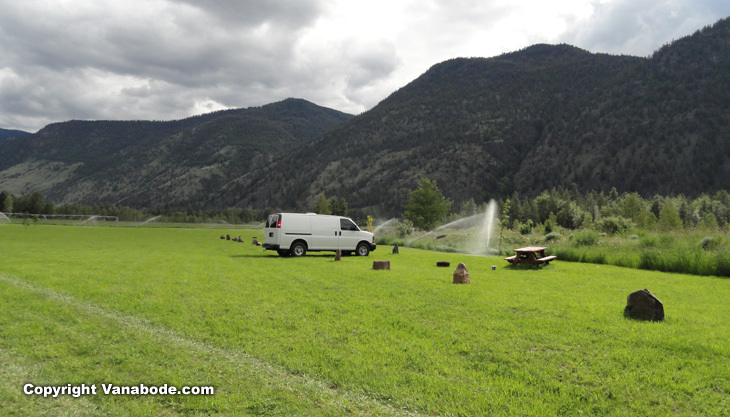 The Omak to Osoyoos portion of this road trip showcased many farmers markets, roadside eateries, small vegetable and fruit stands just off highway. We crossed the border into Canada with our US passports. They did a background check for about 20 minutes but never asked for any other paperwork. They did a 5 minute interview and asked questions like why are you coming into Canada? Have you been here before? Will you be doing any work in Canada? Do you know anyone in Canada? How long will be staying? You want to be prepared to say pretty much "no, no, no, no, we are just here to take a vacation". Once over the border you should follow basic Vanabode strategy and go immediately to the Osoyoos welcome center and stock up on all materials relating to where you want to go and what you want to do. Above: In Canada there are many rural roadside camping spots where people have made access to some portion of their property available to travelers who want to camp. This place had bathrooms and running cold water only and the road leading to it was too steep for rv's, but perfect for a Vanabode. I will be working on a network of places offered by such patrons for the United States next year. We stayed here and were all alone. You simply drop your money in a registration box and leave when you are ready. 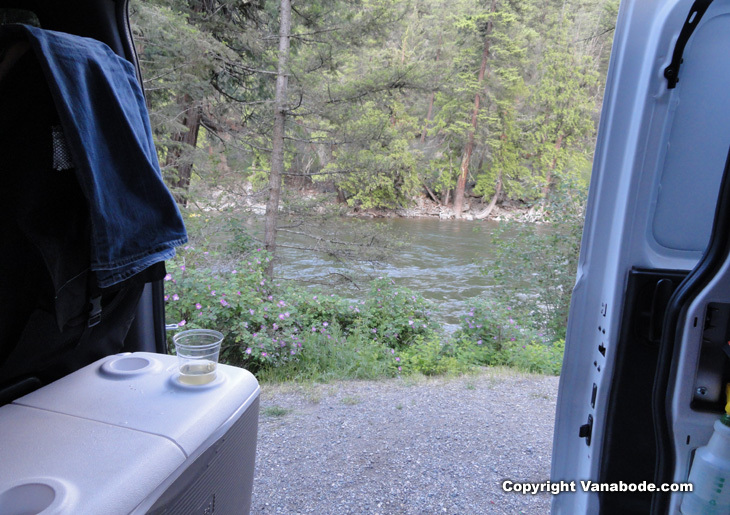 Above: Here we camped for the night 20 feet from the fast cold flowing Similkameen River in British Columbia a little way from the Washington border. We had to pay a huge fee of $21 but had the entire 30 spot campground pretty much to ourselves. The bathrooms were outdoor drop style toilets but they were clean. The best part of this place was solitude, immediate river access and views and the picnic tables were large. You can launch kayaks from here but coming back upstream would be impossible due to the very strong current I won't pay this much again for a campsite so get ready Canada I am bringing the Vanabode lifestyle to you. This area for us was mostly a drive tour. It was very scenic and there are many opportunities to camp and Vanabode here if you wanted to during the warmer months - Lincoln Rock State Park Washington to Hedley Canada.